Before I update you on the Rainbow swing set I bought last month, I need to mention that we already own a swing set. Yeah, I think I forgot to mention that before. Whoops. 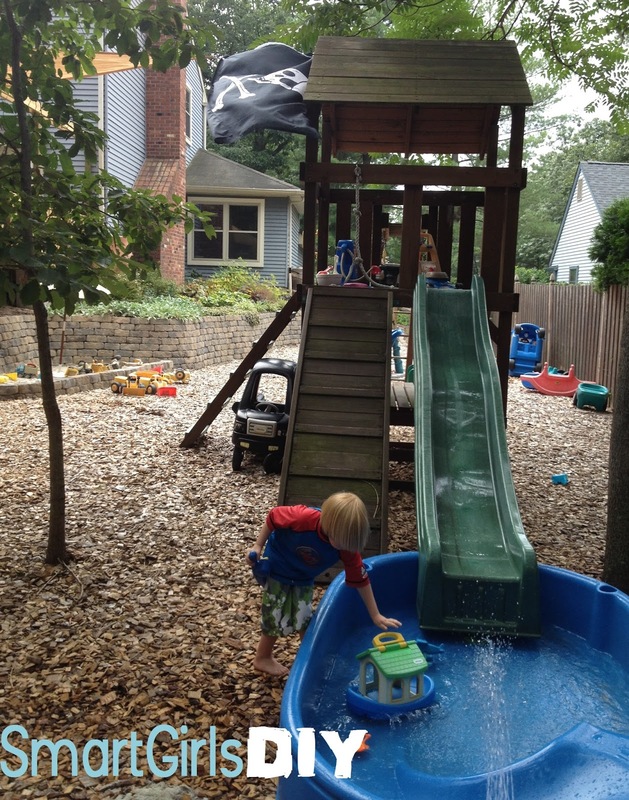 We’ve got a Creative Playthings swing set that’s 7.5 years old. My dad bought it for Smart Jr.’s 4th birthday. It’s been moved twice. We paid to have it moved from our old house here, 4 years ago. Then after a year, we moved it from one side of our yard to another. Last year was the first time I did any maintenance on it. I power washed and re-stained it. And it looks pretty damn great, especially compared to what I’ve seen out there used. Just the other day we found a new way to use our “old” swing set. 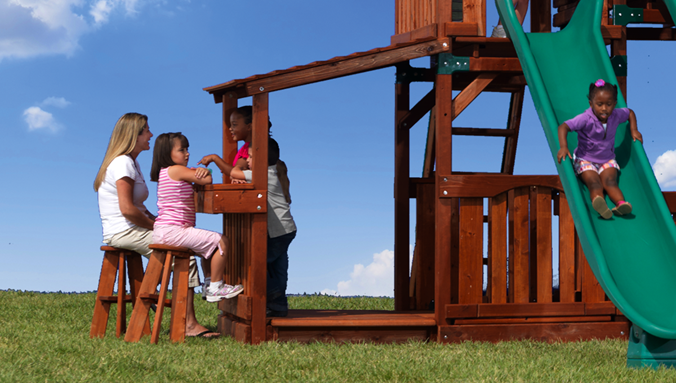 The second swing set was never meant to be a replacement, but an add on. Originally I was thinking about having two towers with the swing arm in between. But the Rainbow set wasn’t a tower type, it’s a castle type. And there wasn’t really room for it anyway, not in addition to our old one. So…. 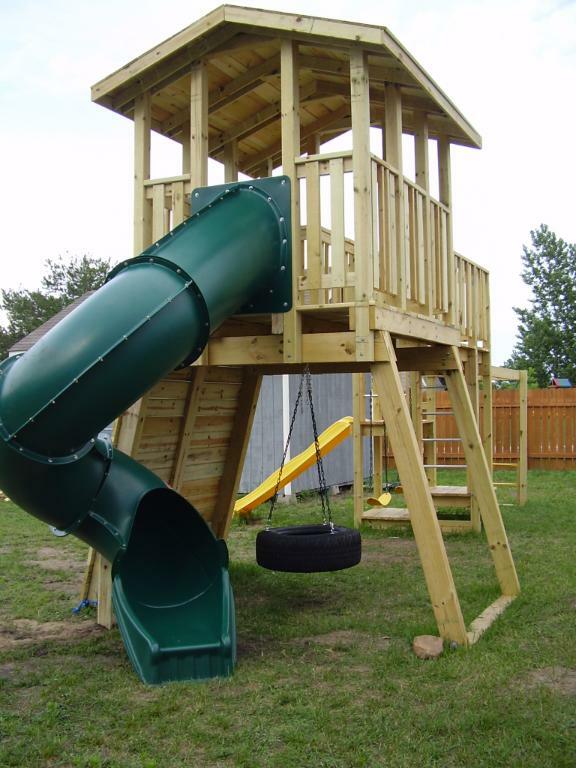 I have been looking for some inspiration to build my own play set extraordinaire and utilize the spiral slide. 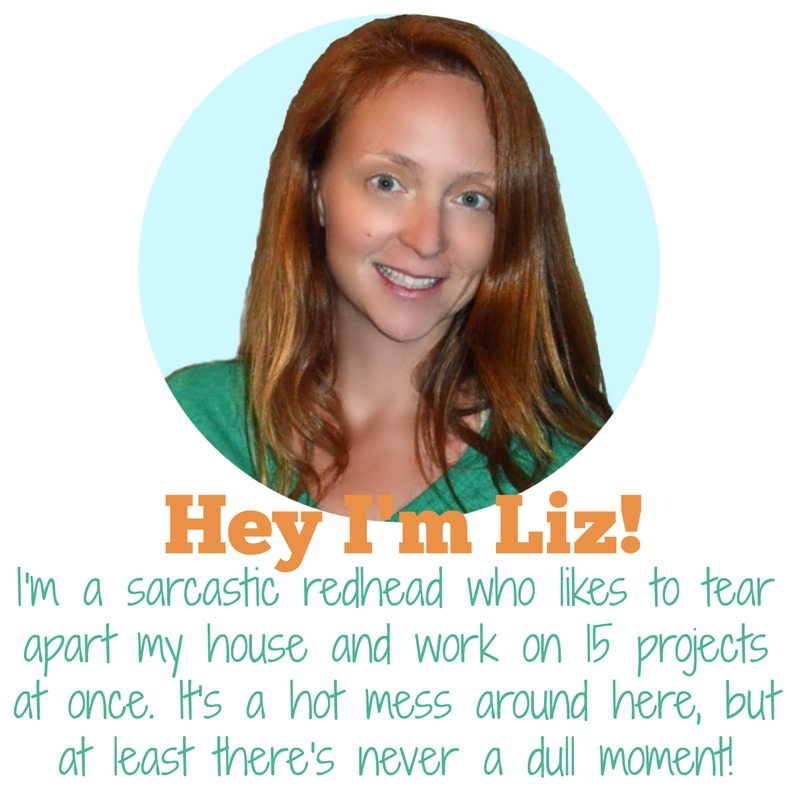 We love to recycle at my house and already have a bunch of tires so I am loving this idea from Exploring Domesticity. And it looks super easy to do, click on over to check out the directions. So there’s no real update, except that I’ve gone over a ton of configurations in my head and on paper and I’ve come up with a couple of possible solutions. No really, I am honing in on 3 separate play areas to emerge from the rubble. 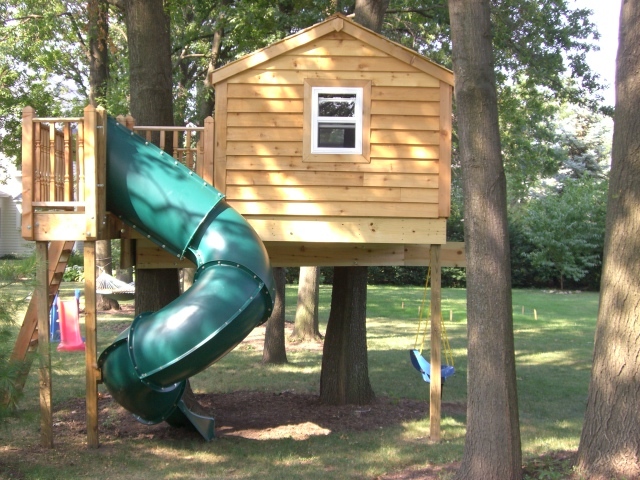 Tween tree house/zip line launching pad. Yeah, this one will be out in the woods, off our property, where I take no responsibility for anyone getting hurt. I will use the platform from the Rainbow swing set and expand on it. 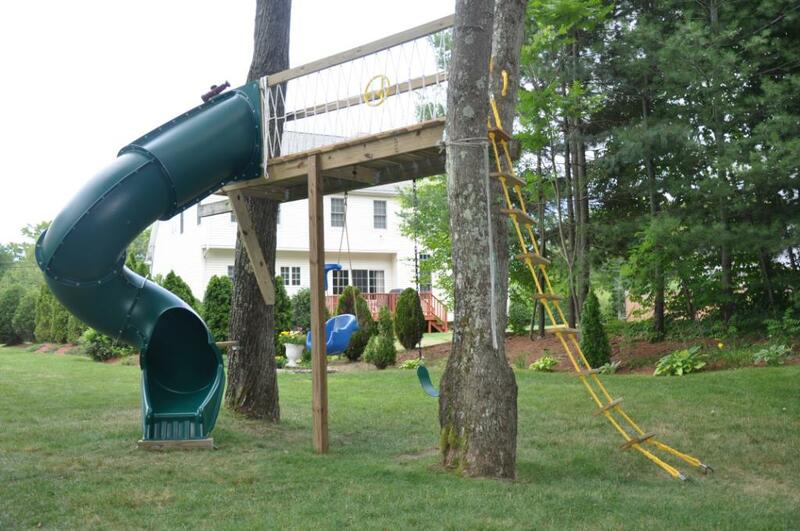 It will be attached to 2 trees, one of the ladders from the swing set and one 4′ x 4′. There is talk of adding a lower level and some rope swings in the area too. Okay, I’m talking about it, but it’s low on my priority list right now. Pirate ship with crows nest and twisty slide. Not sure what other pieces I am going to incorporate from the old swing set, besides the slide, but this structure will be built around 3 trees in the rear corner of the property. Maybe I can use some of the old railings. Oh and the ramp from our old swing set will be the gangplank. And maybe some monkey bars and a plank to walk. We’ll see. This is the project I am going to start ASAP. Clubhouse with swings and coffee bar. Well maybe lemonade stand, whatever they want to use it for, but there will be a window to take orders from. The base of this will be our old swing set. I will wall off the bottom portion, leaving a door and attaching a snack bar on one side. I will attach the swing support beam from the Rainbow set to this and keep the existing slide and ladder. I’ve always toyed with adding a rock wall, so we’ll see. The biggest problem is I need hubby, or a similarly strong human, who will go along with my crazy plans, to help me move our existing swing set over about 15 feet. That will get me started, then I’ll need more muscle along the way. It’s not so easy to attach a platform to a tree 7 feet in the air by yourself, now is it? And, I think I tackle too many projects at once. Ha! 😉 Wow! You should totally go for the zip line! 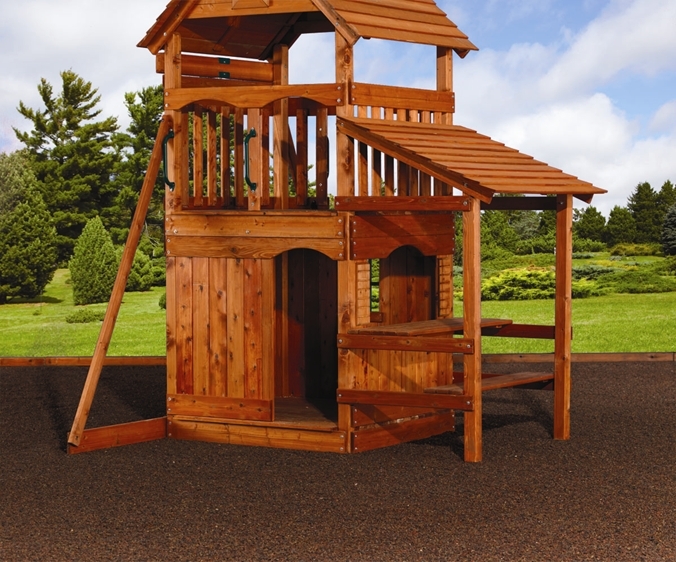 We have one already and it’s perfect for the younger kids because it follows a slope in the yard, so they’re never too far off the ground. Smart Jr. got a second zip line for her birthday (in February!) and we haven’t put that one up yet. She’s insisting on a platform to launch from. I had her out in the woods today applying Thompson’s Water Seal to the platform from the used swing set. It should be up in the trees by Wednesday! We moved this one ourselves but did pay creative play things to move our old set to this house. That was 5 years ago so I’m not sure. A couple hundred bucks I’m sure. I remember it was the same price to move it 10 feet or move it 10 miles! It’s a real pain to move yourself so it’s probably worth the money. Couple of hundred I can deal with. I was thinking like a thousands plus. Glad I’m off. We only want to move it like 6 ft. Back. For safety reasons I wouldn’t want to do it myself. Thanks for the quick response.